Last month I had been to restaurant with my family after a long time. That restaurant is famous for its north Indian dishes. They had a speciall dish Kaju curry. We all tried it for the first time. Kaju Curry goes well with Pulao, but it can also be eaten with Naan .We thought it will be ok kind of. But after we tasted the dish you know what it made us drooling, it was a mouth watering dish, very yummy.So I decided to make this dish at home for my family! I surfed for this recipe. But there are different versions for preparing this curry. I prepared it on my own version.Last Saturday my friends came for lunch so I prepared kaju curry, ButterNan, Fruit Pulav for my family & friends. 2.Cut vegetables into cubes boil them and keep aside. 3.Heat the ghee in a heavy pan and add the cumin. When the seeds splutter, add onions and sauté till it turns a light brown. 4.Now add the ground paste and saut till the fat separates. 5.In another pan heat oil and fry onion till transparent, add the turmeric powder, chilli powder, garam masala, , salt and the green chillies then Add the vegetables and mix well and cook on low heat. 6.When it starts boiling, add all the sauted paste and Add 1 1/2 cups water and the milk, . and keep stirring bring to a boil, and then simmer, uncovered for 3-4 minutes. 7.Serve hot garnished with the coriander leaves. Fruit Pulav is another kid friendlier version. We can take Fruit in any form; with few simple ingredients, this dish can be prepared in a matter of minutes because it doesn’t involve much chopping. It is a mildly flavored with Indian spices and is versatile because it can be served along with any kind of sidedish. Rice mixed with mild spices & fruits gives a whole new taste, fragrance Very healthy and tastes awesome. In my own version I prepared this dish. 1. Wash the rice properly and soak in cold water for an hour. 2. Drain the rice water and dry the rice in a broad and flat based utensil. 3. Boil the water and add rice and milk and half cook it. 4. Cut the apple in a medium cubes. 5. Heat the ghee in a pan, fry the raisins & cashew nuts and keep aside. 6. Heat the ghee in a pan, Add cloves, cardamom, cinnamon bay leaf,chilli paste & garam masala for sauté. 7. Add pre-fried raisins, nuts, paneer salt and sugar according to taste and mix properly. 8. Add fruit of your choice (I added apple, , grapes, pomegranate seed,orange ) and mix it properly, cook it for 2-3 min in a low flame with cover. 9. Turn off the gas, but do not open the cover of Pulao. 10. After few minute open the cover and stir it properly. 11. Enjoy Fruit Pulao with your favorite curry. Note : you can add saffron for colour& flavor . Looks yum Jayashree.Fruit pulav is new and sounds interesting. Smae pinch, we both have the same template. Fruit pulav looks amazing n completely new to me,never heard about this...Kaju curry looks so delicious Jai..
Curry looks so rich and fruit pulav is mouthwatering Jaishree! Kaju curry looks perfect and lovely color. 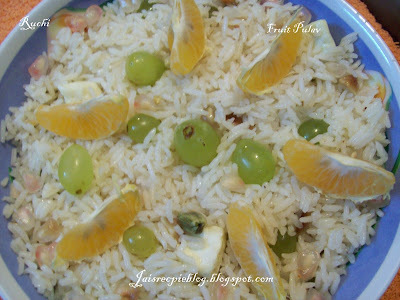 Fruit pilaf is my long time due...thanks for reminding this yummy dish. ohhhh thats a nice and different fruit Pulao. Thats a rich and creamy kaju curry.. looks mouthwatering! Pulao looks lovely! Thank you sriharvatsan for lovely words. Thank you all for encouraging comments& for quick response. woo this looks lipsmashing ...fruit pulv wht a creative idea..will try for my kiddo..thanks for sharing this. I love kaju curry too, loved your version. I have never yasyed fruit pulao. looks very new & delicious. I hope I can try it sometime. is the pulao very sweet to taste? Both the dishes sounds interesting and very much inviting jaishree. Very useful recipes for me dear. This week I m planning to host a dinner for my veg friends. 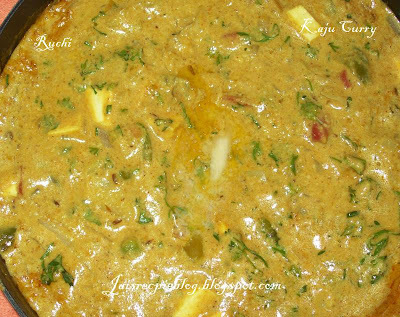 Thought of making mirchi ka salan, but ur kaju curry has stolen my heart and getting in to the menu. nice combo. fruit pulao & kaju curry looks lovely. your blog template looks beautiful! fruit pulav sound yum and new! First time here. Kaju curry and fruit pulav looks delicious. Fruit pulav sounds interesting. Will give it a try. yumm'o yum! love the rich & creamy kaju curry! fruit pulav sounds interesting! nice one..
wow.. both the recipes are nwe to me. I always look around for pulav recipes during the weekends. I am book marking this one Jaishree. Hey i actually was searching a gud recipe for kaju curry and when i read your's i knew that u had got the best as u told that there r many such recipes for this dish. I then i decided to go for it n was just so amazing....just everyone loved it ...Thanks n gud work...keep up the spirits. hi Jaishree.Firtst time to your blog,you have nice recipes! This fruit pulav is very unique! !